Decumanus Green | It Takes a Village . . .
15 May It Takes a Village . . . It is 9 AM Saturday morning April 19, and I am preparing for the arrival of 5 friends who have eagerly agreed to travel to the wilds of Cummington, Ma. to spend the day doing physical labor on my under-construction house. All week the weather had threatened rain, but the actual day turns out sunny, crisp and bug free. Our task for the day is reasonable and hopefully achievable – we will be attaching board and batten siding to one section of the south side. Chris and Bridget arrive first, followed by Jim, Aaron and Samantha (“Sam”). This crew feels like family and in fact they are a family, although not mine. Jim Young is an engineer who lives in Royalton, VT. He is the father of Bridget (Boston) and Aaron (Brooklyn) and the brother-in-law of Chris (Boston). Sam is Aaron’s girlfriend. Since my house is not yet habitable and they all drove many miles to get here, we are spending the night in Great Barrington at the home and farm of our close friend Billie Best. You might say that Billie is the glue that binds us as friends. She began our tradition of helping each other do this kind of friend labor. Five years ago Billie’s husband, Chet, died at the age of 54, and we all started spending a regular spring and fall weekend helping Billie at the farm. 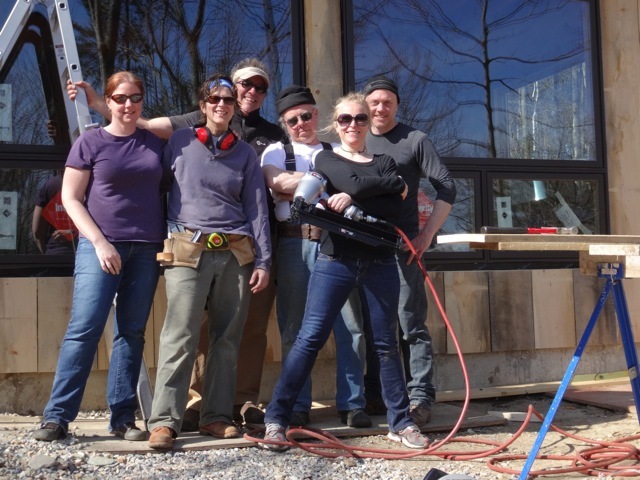 When I began building my house, it was a natural succession to divert the crew to my project. 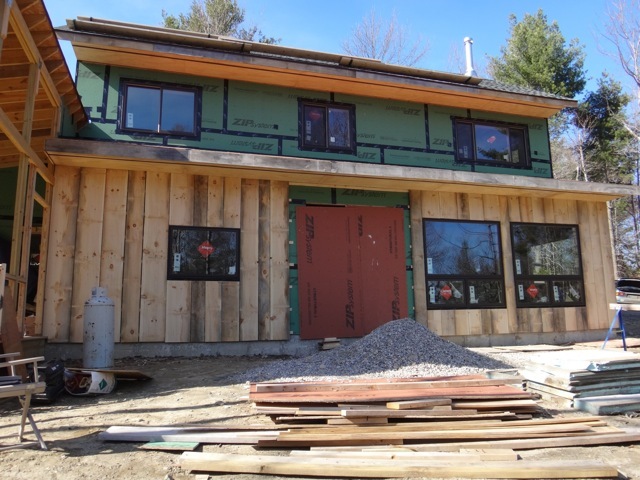 The siding we are applying is eastern white pine, cut and milled from trees on site. The boards are beautiful rough sawn material, 1” thick and up to 13” wide. First we are stapling horizontal 1/2” furring strips to provide an air gap to dry any moisture that might get behind the boards. The Zip system sheathing serves as the rain barrier but the air gap is needed, especially in a super-insulated house, as the sheathing stays colder (and thus wetter) than in a conventionally insulated structure. The battens are 1/2” x 4” but will not go up today. This crew works well together and most have some, if not a lot, of carpentry skills. 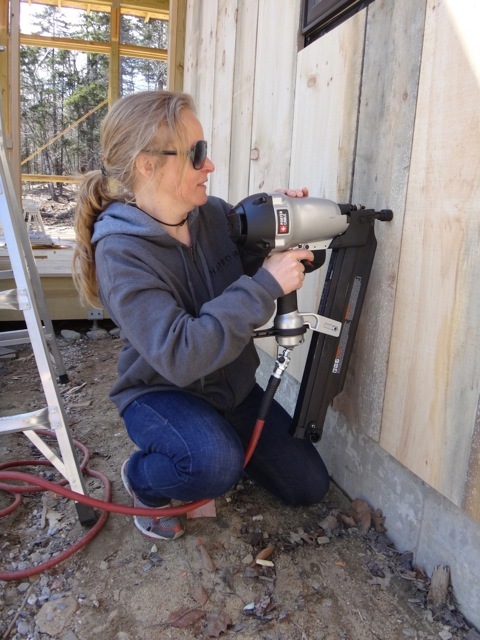 Sam, a documentary filmmaker and editor for MTV reality shows, seems to become particularly fond of using the framing nail gun. By 4pm, we have completed our day’s task and are cleaning up. By 5 we are on the road back to Great Barrington, where Billie and Laura (Chris’s wife) are preparing dinner. I foot the bill for lunch, dinner and breakfast the following morning, and in return we all had a great day, felt productive, and got another step closer to finishing this new house.